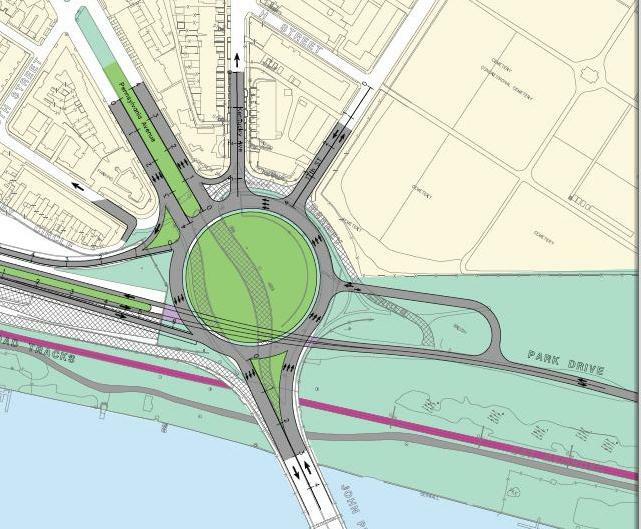 Rendering of the new Barney Circle from the 2005 Middle Anacostia River Crossings Study. The District Department of Transportation is holding its second public meeting on the Barney Circle-Southeast Boulevard Project on Thursday, Nov. 21, 6:30 pm – 8:30 pm at Payne Elementary School (1445 C Street SE). The project involves the construction of a full traffic circle at Barney Circle SE and the construction of a Southeast Boulevard to connect the new circle to the SE-SW Freeway at 11th Street SE. DDOT will be sharing potential options for the project and gathering community feedback. 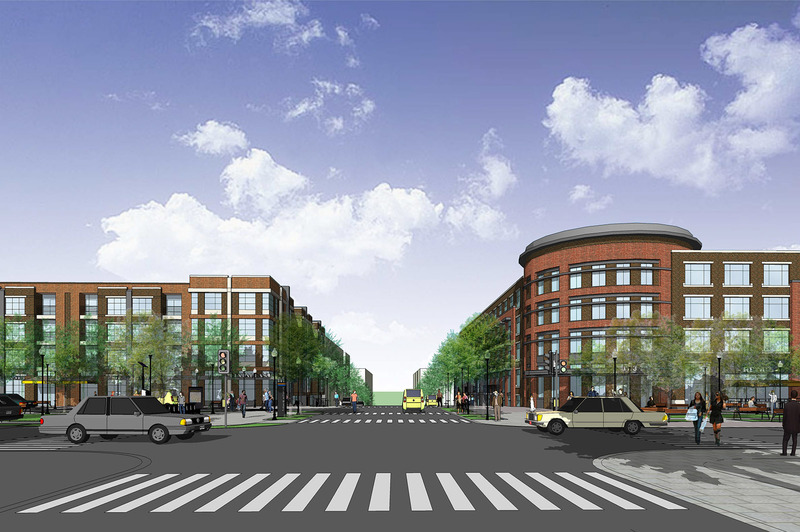 This is a major project with significant implications for the neighborhood. It is particularly important for residents living along 17th Street SE and residents living near Barney Circle SE (Kentucky Ave, Freedom Way, Penn Ave, 15th St,, H Street, 16th St., G St., Potomac Ave) to attend this meeting. During the first public meeting on the project in February, the entire discussion was dominated by questions and concerns about the Southeast Boulevard. I’m hopeful that attendees will get a chance to discuss the Barney Circle portion of the project and its implications for bike, pedestrian and vehicle flow through the neighborhood. My recap of the first public meeting includes more information on the project. Erik Moses, senior vice president and managing director at Events DC, provided a brief overview of the organization, their events and the venues they manage on the RFK site – RFK Stadium, DC Armory, Maloof Skate Park and the Festival Grounds (aka parking lots). View the Events DC presentation (pdf). Sometime in the next two weeks, Events DC will issue an Request for Expressions of Interest for a consultant to formally conduct the study. Moses said they would like to have a consulting firm selected by spring 2014. Moses mentioned that DC United would like to be in a new stadium by 2016 but there is still uncertainty as to when the team will vacate RFK Stadium. The new stadium deal still needs approval of the DC Council. I asked Moses whether Events DC is involved with the group organizing a DC bid for the 2024 Summer Olympics. Moses replied that Events DC is not formally involved with the group, but he expects the consultant to consider the possibility of hosting the Olympics when considering options for the site. Moses also noted that city leaders have not yet formally endorsed a bid for the 2024 Olympics. Moses said it was unlikely that Events DC would seek to urge Congress to change the terms of the ground lease or transfer the land to DC, noting that either strategy would take years of negotiation. When asked about community engagement, Moses said that Events DC is committed to engaging and seeking feedback from the surrounding community and other key stakeholders during the study. After Moses concluded his presentation, Bob Coomber provided an overview of the proposed Capitol Riverside Youth Sports Park to replace the north parking lots at RFK Stadium. Ward 6 Councilmember Tommy Wells and At-Large Councilmember David Grosso have introduced a resolution that the city should explore conversion of the parking lots into recreational space. The fields and green space would be constructed over the existing asphalt and would fulfill a need for sports and recreational fields in Hill East. CRYSP’s presentation included how their proposal would fit with potential future uses of the site, including a new football stadium, Olympics and the National Capitol Planning Commission’s vision (pdf) of a mixed use recreational/cultural space. You can view the full presentation on the CRYSP website. Staff from Ward 7 Councilmember Yvette Alexander, Ward 6 Councilmember Tommy Wells and At-Large Councilmember Vincent Orange attended the meeting and provided brief remarks. Gene Fisher, who staffs the DC Council’s Committee on Business, Consumer and Regulatory Affairs for Councilmember Orange, briefly discussed the Councilmember’s bill to require the city to conduct a feasibility study of a potential 100,000 seat superdome, indoor water park, soundstage, hotel zone and an upgraded Langston Golf Course. Task force members expressed concern about Councilmember Orange’s lack of outreach to the community prior to the bill’s introduction (I plan to post some additional thoughts on Councilmember Orange’s bill soon). The task force made a recommendation that ANC 6B send a letter to Events DC thanking them for the presentation and reinforcing the need to seek community feedback and input throughout the study period. The task force also suggested that the commission urge Events DC and their consultant to seek neighborhood serving uses for the site, uses that would bring residents to the site 7 days a week and not just for special events. 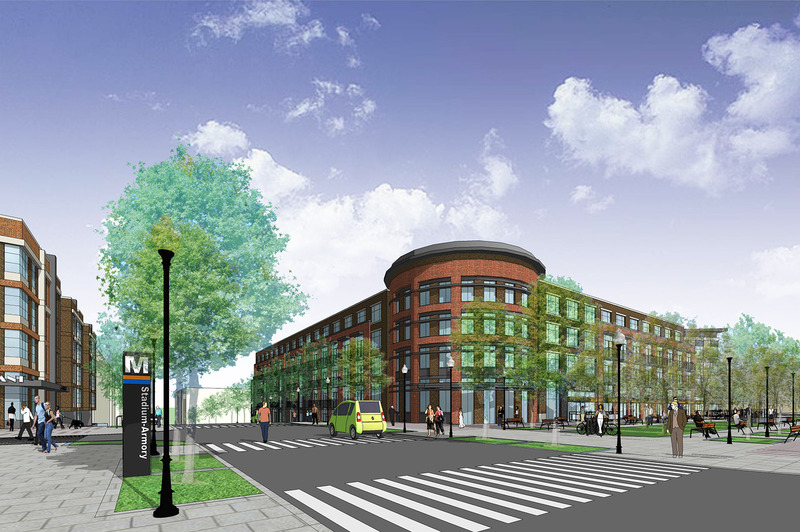 ANC 6B will consider the recommendation at its next regular meeting on Tues., Dec. 10. I’ve previously posted my thoughts on the future of RFK and plan to post some additional thoughts in the coming days. If you attended the meeting, please post your comments, thoughts or anything I missed below. A big thanks to our presenters, community members and task force members for their participation. And a special thanks to the folks at St. Coletta of Greater Washington for hosting the meeting. Reservation 13/Hill East Waterfront – On Oct. 24, the Deputy Mayor for Planning and Economic Development’s Office announced that Donatelli/Blue Skye had been awarded development rights for parcels F1 & G1 at Reservation 13. DMPED and Donatelli/Blue Skye are now negotiating on an agreement that will allow the project to move forward (terms of land transfer, etc.). This agreement will need to be approved by the DC Council, most likely in early 2014. The Donatelli/Blue Skye proposal calls for two mixed-use buildings with a total of 354 apartments (248 market rate, 106 affordable) and 20,000-40,000 square feet of retail on the first floors, including the possibility of retail along the C Street extension. Donatelli/Blue Skye has also updated their proposal to remove the “traffic island” around the Stadium-Armory Metro plaza. 1442 Pennsylvania Avenue SE (Old KFC site) – Construction has begun on this two-story retail building at the corner of 15th and Penn Ave SE. Douglas Development hopes to have construction completed by the end of the year. As for tenants, Douglas Development has not yet signed any leases though there has been interest in the site. 1600 Pennsylvania Avenue SE (Used Car Lot – formerly 1550 Penn Ave SE) – NOVO Development hopes to begin construction on this 77-unit residential building by the end of the year or in early 2014. Greg Selfridge and the NOVO team plan to hold a community meeting soon to discuss construction and its potential impact on surrounding neighbors. I’ll share information on the meeting once it is scheduled. 1500 Pennsylvania Avenue SE (Old Domino’s site) – Goldstar Group plans to build a 41-unit residential building at the old Domino’s site, with a mix of two bedroom, one bedroom and junior one bedroom units. While they plan to provide the required 21-parking spaces in an underground garage, Goldstar will probably have to ask the Board of Zoning Adjustment for zoning relief related to the size of the parking spaces (6-8 will have to be compact spaces). Goldstar is pushing the building as close to the 15th & Penn Ave SE intersection as possible to preserve some open space between the building and adjacent structures. The parking garage entrance will be off of 15th Street SE. Goldstar will present their plans and preliminary designs with neighbors at a community meeting in the coming weeks. I’ll share information on the meeting once it is scheduled. 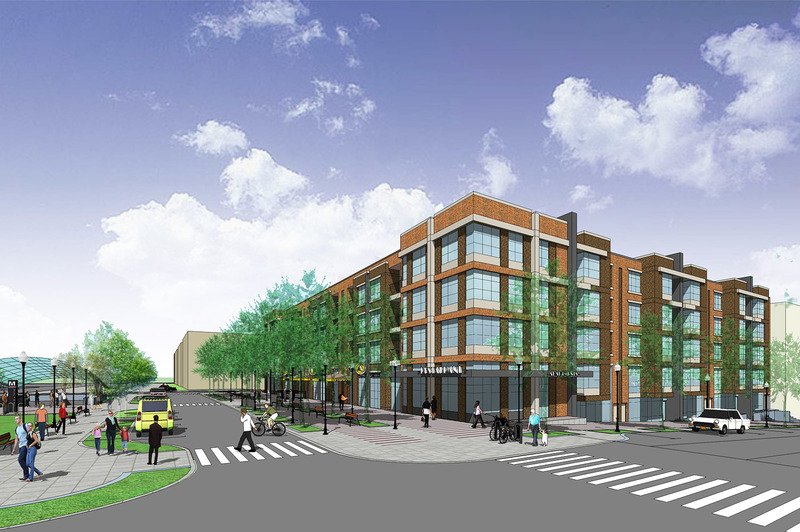 401 15th Street SE – Goodeon Kingston, LLC has begun construction on a 12-unit mixed-use retail-residential building at the corner of 15th & D Street SE. The big news is that they have now decided to include retail space on the first floor..about 1,000 square feet. Goodeon hopes to have concrete and foundation work completed by the end of the year. The building will have the six parking spaces required by zoning. Barney Circle-Southeast Boulevard Project – The District Department of Transportation plans to hold its second public meeting on the Barney Circle-Southeast Boulevard Project on Thursday, November 21, 6:30 pm at Payne Elementary School (1445 C Street SE). At the meeting, DDOT and their consultant, CH2M Hill, will present options for public feedback. I encourage anyone who lives near Barney Circle to attend this meeting. 17th & 19th Streets Safety Improvement Project – The good news is the design phase of the 17th & 19th Streets Safety Improvement Project is complete. The bad news is that DDOT has asked a consultant to do an additional environmental review of the project recommendations which will add another 6 months to the project timeline. We are now looking at mid to late 2014 for construction to begin. I plan to urge DDOT to move as swiftly as possible to complete the additional review and begin construction. The District Department of Transportation has scheduled a June 27 meeting to provide a progress report on the 17th & 19th Streets Safety Improvement Project. Unfortunately, the meeting conflicts with the June 27 ANC 6B Hill East Task Force meeting on the future of the DC General shelter. Since many Hill East residents plan to attend the meeting on DC General, DDOT was kind enough to share with me the information and handouts they plan to present and distribute on Thursday. Note that the final recommendations for the 17th & 19th Streets project remain the same as discussed last fall – DDOT will not announce any major changes at the meeting. DDOT’s June 27 meeting on the project will take place from 6:30 pm – 7:30 pm at Pilgrim AME Church (612 17th Street NE). You are currently browsing the archives for the 19th Street SE category.